Peanuts add a special crunch, a special taste to any vegetables. I know a few of you will not agree with me especially if you do not like peanuts. Don’t worry, just substitute the peanuts with cashew nuts. 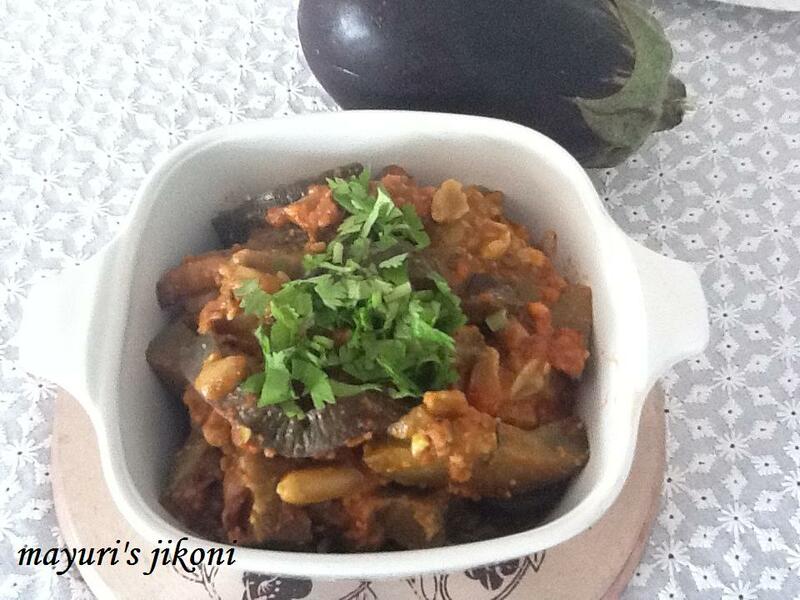 Brinjal, eggplant or aubergine vegetable does not have to be boring. Add crunch and flavour and it will be appreciated by most of your family. I know a lot of kids do not love aubergines. Aubergines are packed with iron, and the most nutritious part is the skin. Easy to make and cooks in a jiffy. Grind the peanuts in a food processor to get a coarse powder. It is alright to have a few whole peanuts in it. Wash and cut off the stem part of the brinjal. Cut the brinjal into chunky chips (sticks). Leave the chips in water till you are ready to cook it. Heat oil in a pan. When it is hot, add fenugreek, mustard and sesame seeds. Cover with a lid as the sesame seeds may splutter out of the pan. Open the pan, add asafoetida, peanut powder and garlic. Saute for a minute. Add green chilli and ginger paste. Saute for a minute. Add turmeric powder and the brinjal chips. Add salt. Mix and add water. Cover the pan and let the brinjals cook over low heat for 5 minutes. Add jaggery, coriander cumin and red chilli powder to the tomato puree. Pour the tomato puree over the brinjals. Cover and cook for a further 5 minutes. Mix gently and garnish with fresh coriander or fenugreek leaves before serving. Serve with hot chapatti , parathas or naan. Put peanuts in the oven in a tray and bake at 150°C till you can easily remove the skin when rubbed between your thumb and finger. Remove the skin and store in an airtight jar till required. Most stores sell ready roasted peanuts. For the recipe of coriander cumin powder refer to my recipe Nunu’s biryani. To make fresh tomato puree refer to my recipe dal makhani. If you don’t like sweet vegetable, avoid adding the jaggery or sugar or use less. Add a tbsp of tamarind pulp for a tangy taste. I like to use the big spongy variety of brinjals for this recipe. If the brinjal has too many mature seeds, then do not use it as it may not cook too well. Don’t buy soft brinjals. They have to be firm, and the skin appears shiny. A lovely combo! Thanks for linking it to The Veg Box event!